NUK First Choice plus Bottles feature the original NUK orthodontic shaped teat with a special, super soft zone which adapts perfectly to baby's palate. 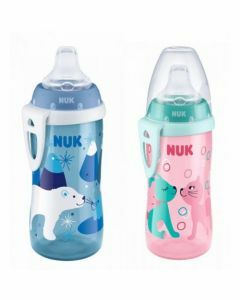 NUK has developed a range of the best baby bottles to make the transition from breast to bottle feeding easier. The teat has an extra wide lip support which simulates breast feeding as closely as possible and the improved NUK Anti-Colic Air System minimises infant colic caused by the harmful swallowing of air, this also helps prevent the teat from collapsing.